The Soil and Terrain database for Nepal primary data (version 1.0), at scale 1:1 million (SOTER_Nepal). SOTER_Nepal is generalized from the original Soils and Terrain database of Nepal at scale 1:50,000 compiled by FAO and Nepal's Survey Dept. 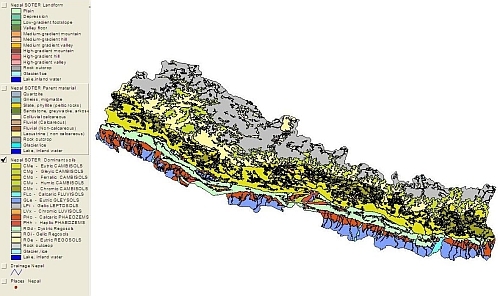 The SOTER_Nepal database provides generalized information on landform and soil properties at a scale 1:1 million. It consists of 17 SOTER units, ... characterized by 56 representative and four synthetic profiles for which there are no measured soil data. The SOTER database includes also attribute data of 99 profiles initially selected as references to soil components that have already a representative profile. 896e61f8-811a-40f9-a859-ee3b6b069733 Access to the portal Read here the full details and access to the data.